Fences and decks are expensive additions to your home. They provide a place to relax and enjoy yourself with your family. Just like any other part of your home, they need a little TLC from time to time. Even if you seal your fence or deck, eventually the sun, rain, wind, and organic growth will take its toll. We’ve all seen weathered fences that are covered in algae or have turned grey over time. Let us turn your fence or deck back into a bright, beautiful part of your home. Get a quote today for deck cleaning and fence cleaning in St Simons Island! Just like with your home, roof, or driveway, there is right and wrong way to clean your wood fence or deck. High pressure washing will only cause damage. It takes a combination of the correct cleaning materials and application techniques to make sure that the job gets done right the first time. Give us a chance to show you what we can do! There is a lot more to taking care of your deck cleaning in St Simons Island than just wanting it to look clean. In addition to improving the appearance this is also essential for preventing further damage from happening. Your deck is the ideal outdoor living and entertaining space where you and your family make memories all summer long. How many summers that is depends on the amount of care you invest in your deck. And the amount of wear and tear your deck gets directly impacts the frequency with which you should be taking care of cleaning and staining it. But one thing is for certain, you cannot expect to have years of use with investing some basic care into it. At the very least you should be taking care of annual deck cleaning. Some people prefer to do this in mid-spring as they prepare to use their deck space. Others prefer to take care of annual deck cleaning following the close of the season in late fall. If you really want to take care of this investment, you can consider performing a professional cleaning at both times. Keep in mind the trick to a successful deck cleaning is all about the quality of the work. For instance, if you try to simply rent a pressure washer and take care of it yourself then you are not going to have the high level of cleanliness you need. Nor will you have the results you want if you hire a professional who doesn't bother to take care of the wood the way he or she should. Taking care of minor repairs as opposed to just cleaning the surface makes all the difference. 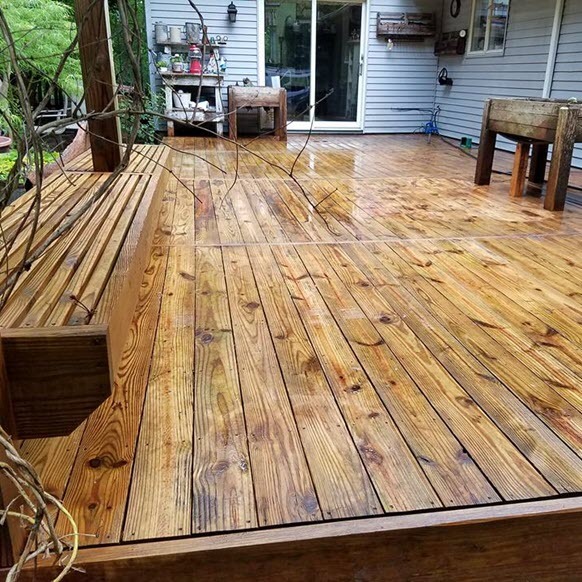 If your professional power washer neglects to make sure the deck is in good shape they could actually end up doing more harm than good. Letting water at high velocity get into damaged wood can actually lead to rot. Contact us today to get a quote for Deck Cleaning in St Simons Island and the surrounding areas! Get a Free Estimate by Emailing or Calling us! We proudly serve Brunswick, St. Simons Island, Jekyll Island, Sea Island, Darien, Kingsland, St. Marys, Waycross, Camden County, Glynn County, McIntosh County, Brantley County, Ware County and the surrounding areas. We want to be the last pressure washing company that you ever have to call! Offering a variety of pressure washing and soft washing services.